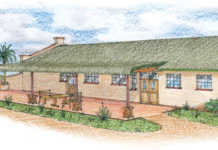 Shiela require assistance from Jonno to design a double-storey farmhouse with two bedrooms. I am very intrigued by your designs and love them. I would like your wisdom in designing a double-storey house at a village on top of a hill overlooking a gorge. 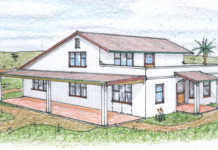 It should give an impression of a farmhouse with two bedrooms upstairs and a patio facing west for a nice sunset view. The ground floor should have one bedroom, an open design of the dining and sitting rooms and a kitchen with open patios. The staircase should not be too steep to allow for elderly people to go upstairs and view the sunset. 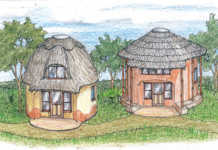 It is envisaged that it will be built using stones and a thatched roof. It’s good to know that you are intrigued by my articles and I hope to intrigue you even more with the conceptual design. Using what’s locally available is always a good idea. You didn’t say, but from your email, it appears to be from Botswana. I’ve shown the veranda at ground floor level as this is where your outside living will take place, adjacent to the kitchen and living room. An upstairs balcony can be created over the veranda, with French doors in place of the windows of the third bedroom. Using rock (fieldstone) for the foundations and walling can save substantially on basic costs. 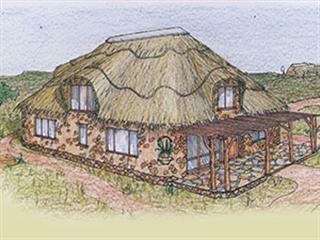 Also thatching for the roof lends itself amicably to creating those two rooms upstairs. It’s there, so why not use that roof space? Complementing that rustic rockwork appeal are the hardwood tree posts for the veranda, with beams and laths for overhead shading. Sadly you’ll only need to buy windows, doors, cement and plumbing goods. When I detail your final plans, I’ll show you how to save even more with what’s locally available.